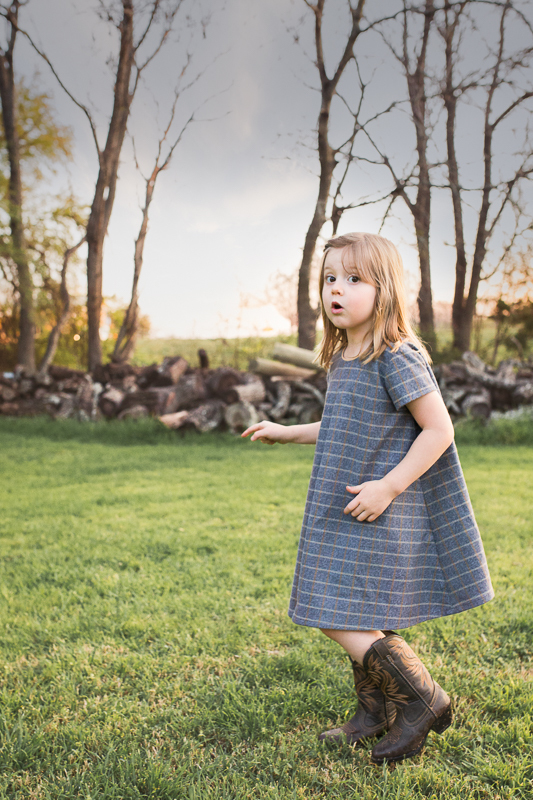 Today I'm sharing the Eleena dress, a new pattern by my friend Olga from Coffee and Thread. I had been looking forward to making this one for a long time and it does not disappoint! This dress has so many great details and the pattern drafting/grading is impeccable. There are three different sleeve options : long sleeves, short sleeves, and flutter sleeves. 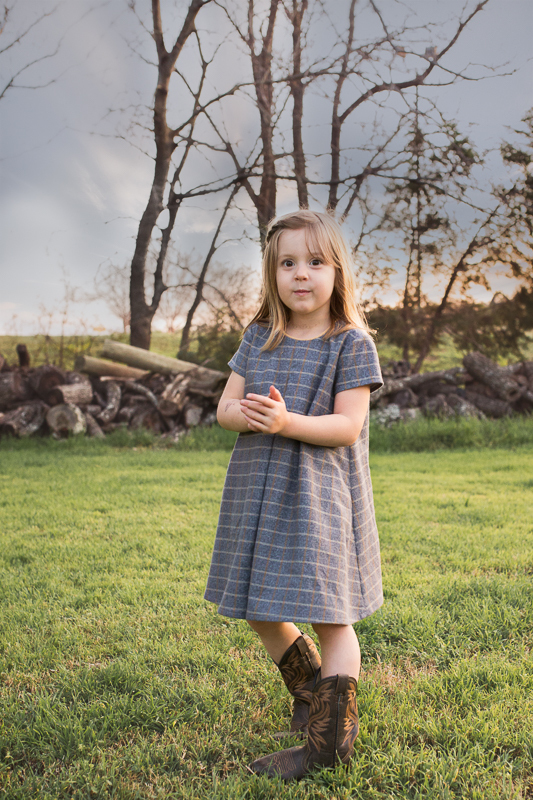 I love that - you could sew this dress in every season. I also really like the center panel. There are so many fun things you could do with it. I chose to cut mine on the bias. The pattern has a vintage style collar, but I decided to leave it off this time after seeing Mie's version here. Instead I added some beige piping to the neckline. I love the dress' center pleat. The lines of the dress are so beautiful. I love how the dress has so much swing. To me, it gives it such a sweet and classic look... without being too sweet, you know? The back finishes with an invisible zipper. I used a brushed cotton that I found at Joann's several months ago. Last weekend Dan and Iris were out running errands together and Iris convinced him to buy her a pair of cowboy (cowgirl?) boots. We've been working on trying to teach Iris and Tia the difference between play shoes and dress shoes. Man, dress shoes these days don't seem to hold up to anything! These boots have been a good option for Iris, because they make her feel fancy while still being durable like tennis shoes. And they were inexpensive. Maybe this speaks to my level of intexication, but I have to admit I find them pretty darn adorable on her, too! 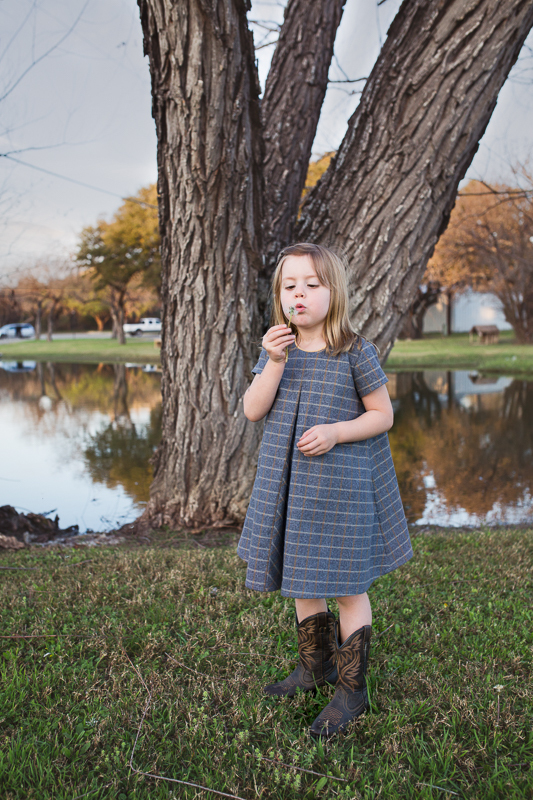 The Eleena dress is on sale for only $7 until March 7th! You can find it here! Simply fabulous! (And she's right about those boots...) I love what you did with the neckline, and that fabric is so perfect. Love the dress! It looks so classic and pretty! Love the bias tape. I am going to steal that idea. :) :) And the pictures are gorgeous! Thak you so much for being on the tour! Oh Rachel, as usual your fabric choice is just fabulous. It makes the dress. Re: dress shoes vs. play shoes - we fought that battle for about 18 months and I'm proud to report we have finally won (because you are right, dress shoes are such crap these days). My girls have been uncomplainingly wearing their respective sole (ha ha) pairs of fall/winter shoes every day this season. Now if only I could get my son to wear his church shoes to church without complaining. In that second to last photo, Iris looks like she's sneakily tiptoeing along in her cowgirl boots - ACK, the cuteness is killing me! She is adorable. I love the classic "little-girlness" of this dress. The piping and bias panel are so sweet! Great details, perfect little dress, but Iris steals the show. Very sweet, Rachel! And super clever to cut that panel on the bias. 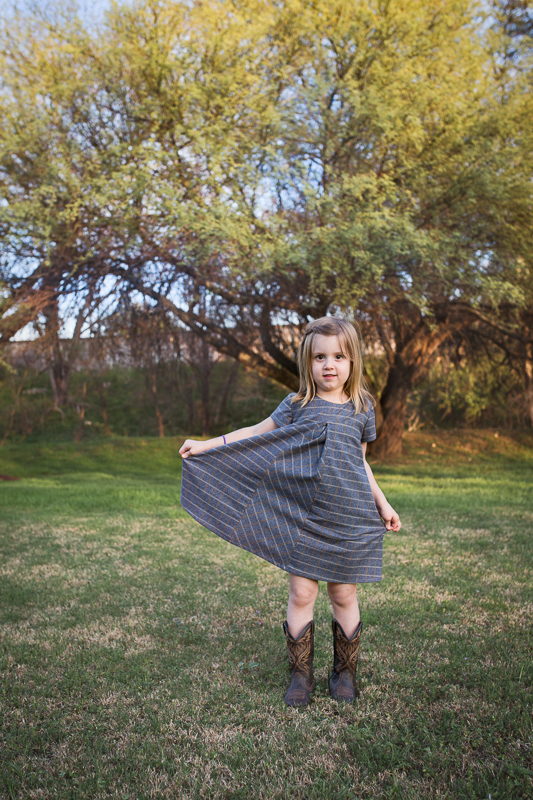 Oh, and tell Iris that Ellery loves cowgirl boots too. Once her red ones wore out this past year, Santa brought her gold glitter ones!! What an adorable dress, I really like that high bodice. 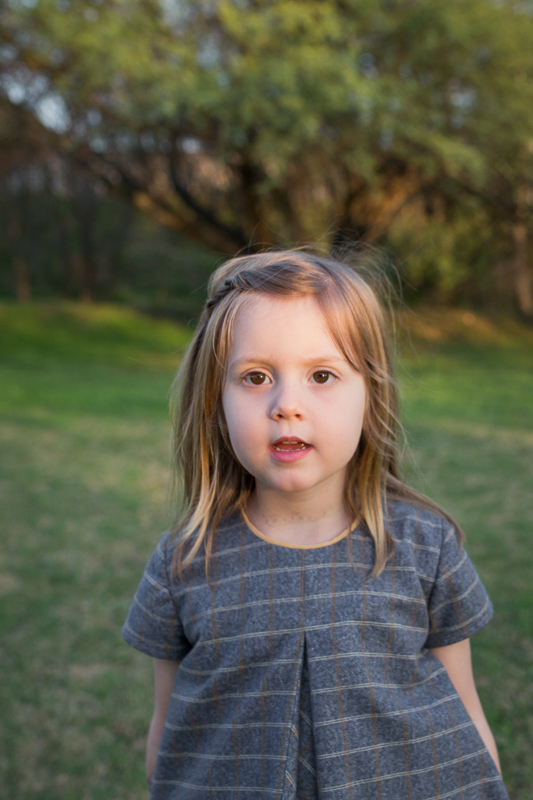 Trixie is getting skinny arms and legs but has a really fat toddler tummy, this pattern would be so nice on her. 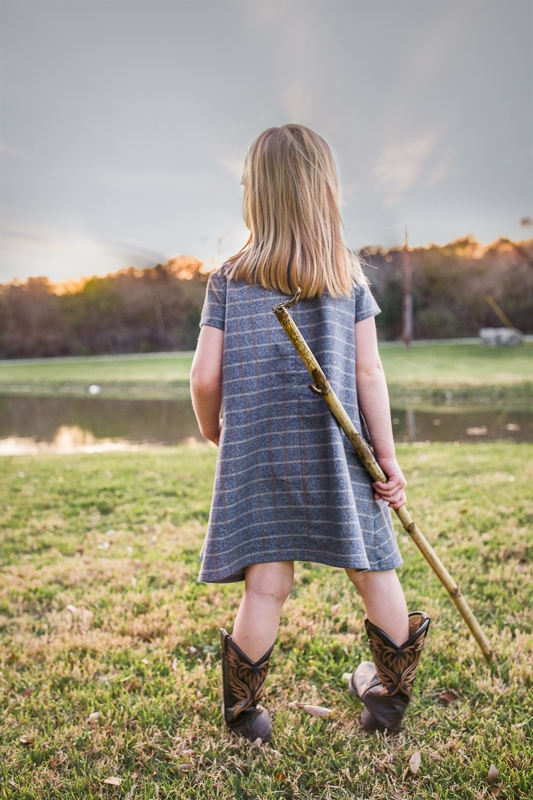 My guys wear long boots outside in all seasons because of the snakes so dresses and boots are the norm here. PS I subscribed to your blog months ago but my first one arrived in my email today. It was so exciting. Eeee it's so cute on her! Love it with the boots and I've never even BEEN to Texas, haha. So glad you didn't lose these photos, they're gorgeous. That light!! 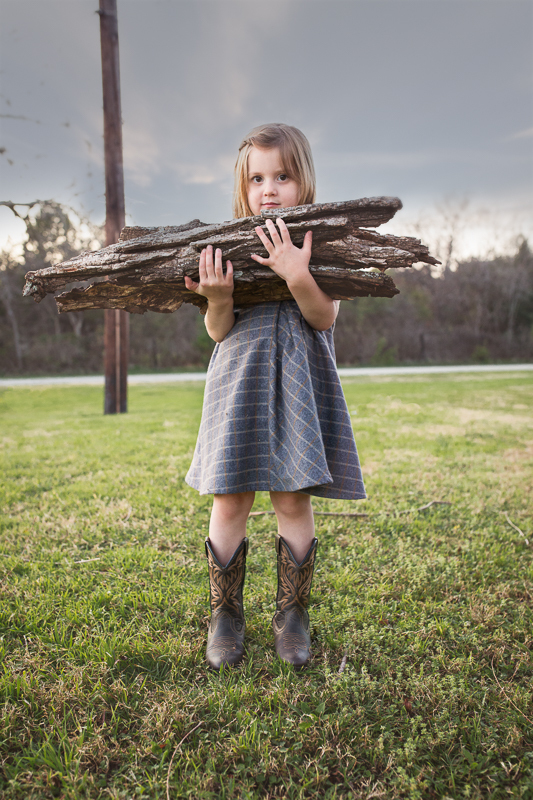 Also that photo of Iris with the armload of wood is amazing. Hey have you heard of the youtube channel "primitive technology?" This guy builds huts and all sorts of stuff with his bare hands and tools he makes. It's amazing. I bet your kids would love it. 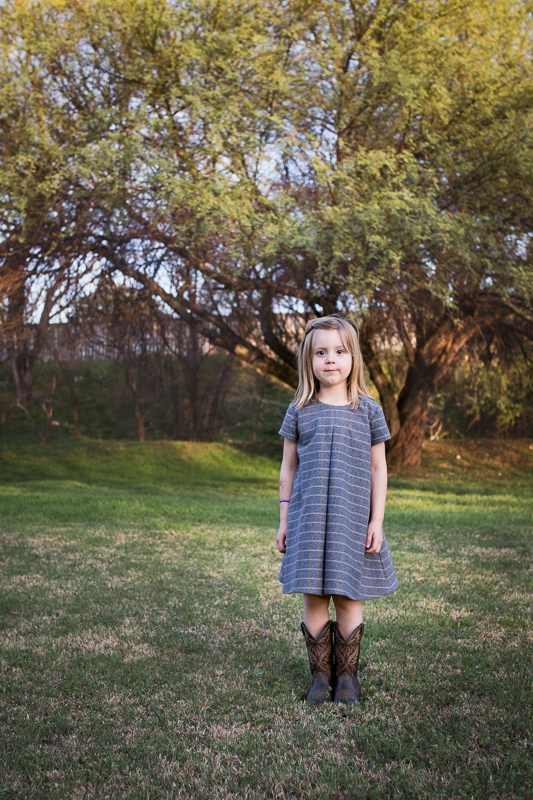 can I just join in on loving on sweet Iris in her adorable cowgirl boots and Eleena dress?! and of course, your photography . . . the lighting is fantastic! I love your choice of fabric for this dress, as it doesn't make the dress come off as too "sweet". That middle panel is fantastic - what a great pattern! The dress is indeed sweet without being too sweet :) Love the centrlal panel cut on bias, it adds such a lovely detail. Piping... Oh how I love piping! a perfect little touch :) I think I will go crazy with piping when my good machine will return home! 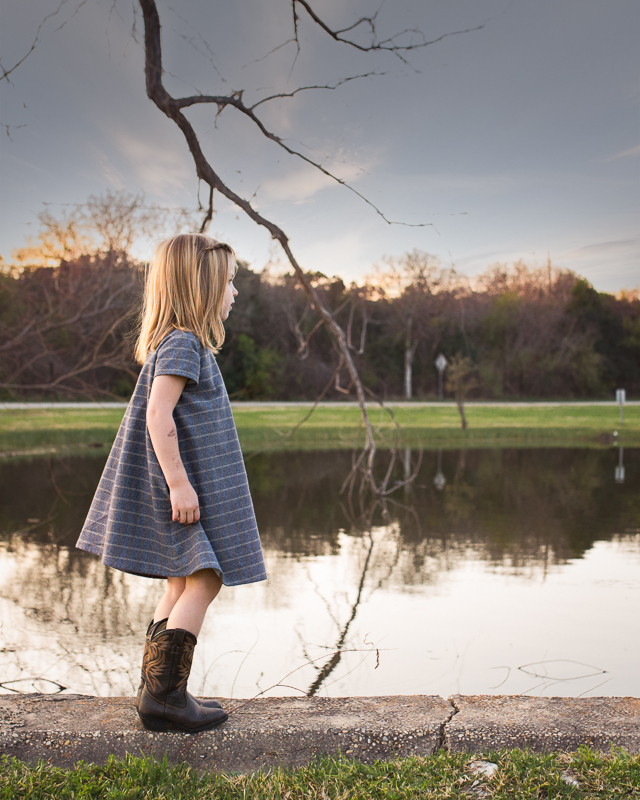 Love, love cowgirl boots and dresses! Glad to see Texas rubbing off on you. That profile pic of Iris showing the beautiful swing of the dress is stunning. Boy did you find the perfect golden hour! Whoa, what a great dress with so much swing!! Love your fabric choice and beautiful shots, as always. Another one to add to my list. 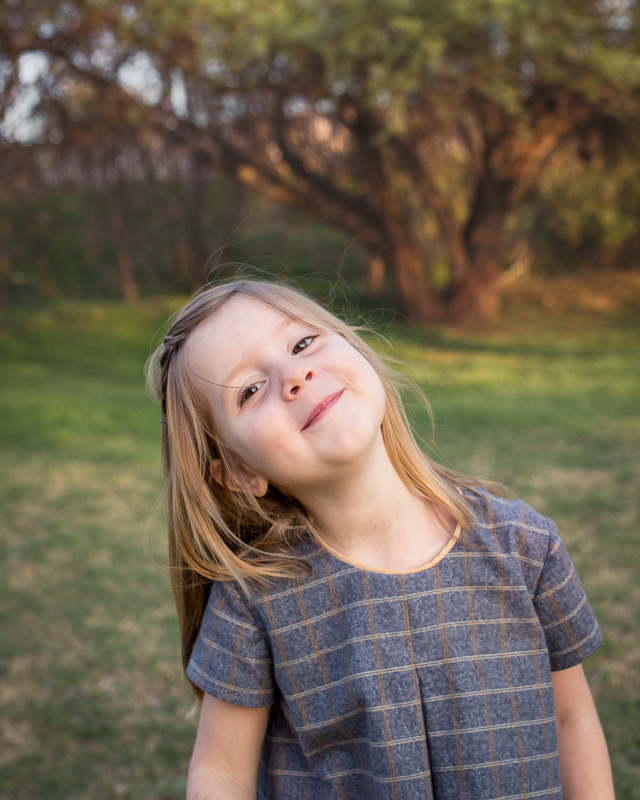 This dress and these photos and the girl are all so great! The swingy shape of the dress is perfect. Vintage and playful, and perfect with the minimalism of the rest of the dress. Like others, I love the fabric, and I have to say its niceness is accentuated by the gray sky and orange trees in the photos! This is so beautiful and perfect. The dress, the photography, the fabric/colors -- everything. I love it all!! Such a beautiful dress, what material is that? My daughter would love that, I might have to make one myself, on my new sewing machine (Brother XL2600i) which my husband got me lol..
Ok, iris you are just the cutest. but Rachel that fabric!!! I want some. that would make the most smashing shift dress for me! Good thing Iris is little and on the other side of the world 'cause I would absolutely steal that dress right off her back!